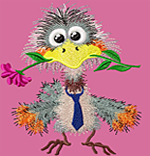 Machine Embroidery Design "A Date". In the Applique Technique, the order of embroidery is attached. Machine Embroidery Designs Set "Grapes-2".